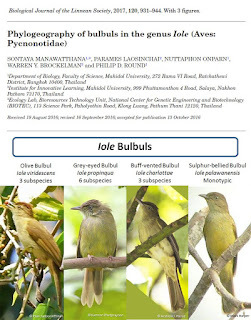 S. Manawatthana, P. Laosinchai, N. Onparn, W.Y. Brockelman & P.D. Round. 2017. Phylogeography of Bulbuls in the Genus Iole (Aves: Pycnonotidae). Southeast Asia is one of the most geologically dynamic regions of the world with great species diversity and high endemism. 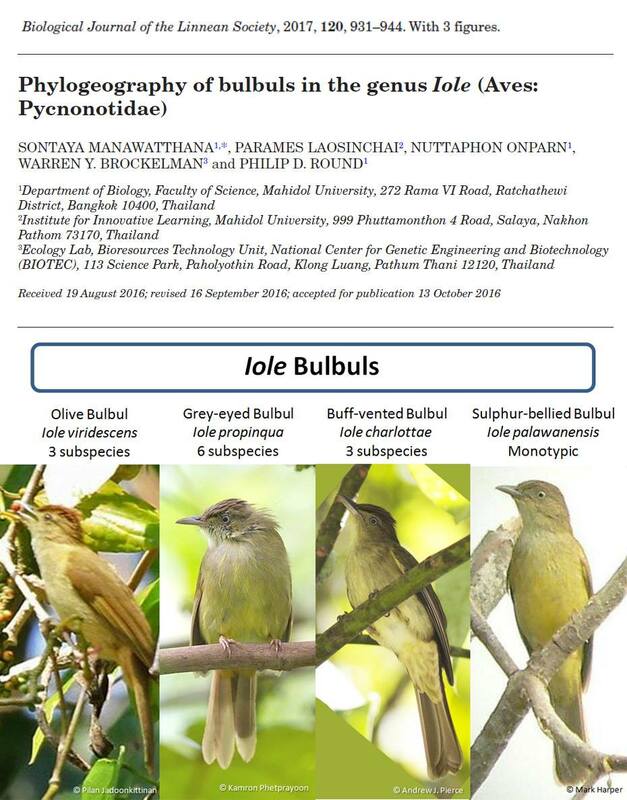 We studied the bulbuls of the south and southeast Asian genus Iole (Aves: Pycnonotidae) in order to analyse their evolutionary relationships and describe their patterns of diversification and delimit species boundaries. Our phylogeographic reconstruction, based on two mitochondrial and one nuclear markers, sampled from all 13 recognized Iole taxa, presently grouped as four species, revealing three primary lineages: (1) a Palawan lineage (2) a Sundaic group distributed in the Malay Peninsula, Sumatra and Borneo and (3) an Indochinese group distributed throughout continental Southeast Asia. Divergence time estimation suggested that the Palawan lineage diverged during the Miocene (around 9.7 Mya), a later split between the Sundaic and Indochinese lineages occurring around 7.2 Mya. 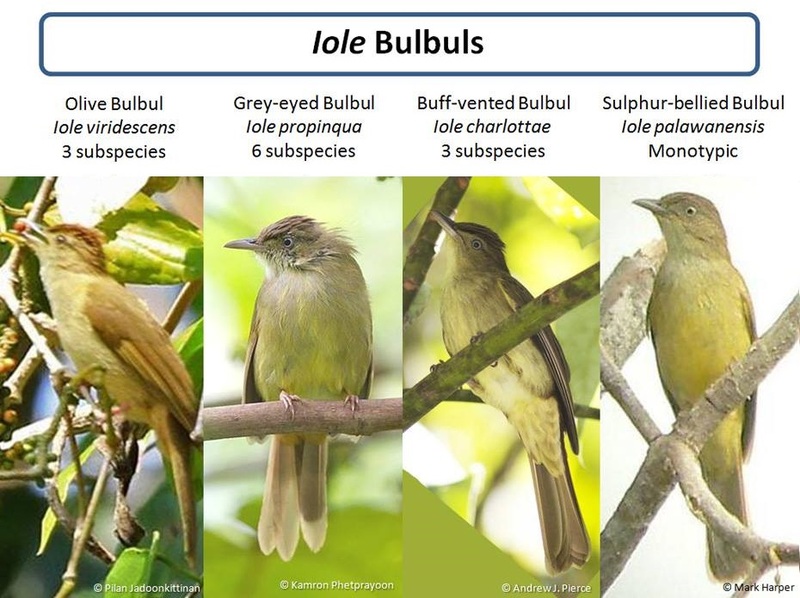 The present classification of Iole based on morphology does not accurately reflect taxonomic relationships within the genus, in which we recognize five more putative species. An integrative approach that incorporates morphology and bioacoustics should further refine our understanding of species limits among Iole taxa. 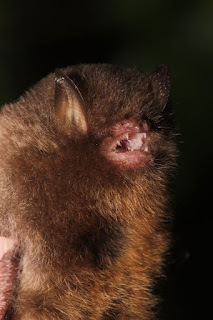 Since its discovery, the taxonomic status of the only species of Kerivoula (Chiroptera: Vespertilionidae: Kerivoulinae) to be found on Taiwan has been confused. Previous studies have assigned this species to either Kerivoula hardwickii or K. titania, both of which occur on continental SE Asia. This uncertainty supports repeated suggestions in the literature that specimens of K. hardwickii collected and/or sampled across SE Asia are likely to represent multiple cryptic taxa. To address these issues, we combined new and existing data from the genus Kerivoula on Taiwan and continental Asia, and performed diagnostic analyses in steps. 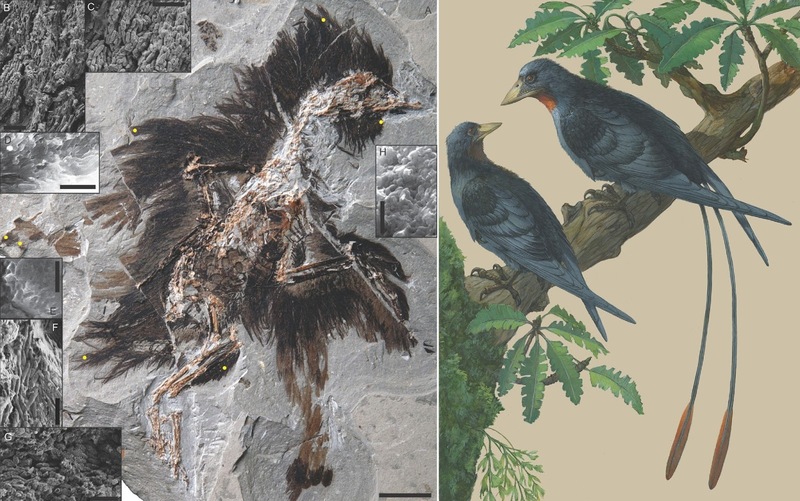 First, phylogenetic reconstructions based on mitochondrial and nuclear DNA revealed a well-supported group comprising all taxa currently recognized as K. hardwickii, together with the Taiwanese Kerivoula and Kerivoula kachinensis to the exclusion of all other congeneric species. Second, focusing on all members of this monophyletic clade (i.e., K. hardwickii complex) together with K. titania, we used multivariate statistical methods to separate taxa based on morphometric data. Our results provide strong evidence that among these bats, the Taiwanese Kerivoula is a new species that also occurs on continental Asia, for which we provide a formal description and name. In addition, we show that the subspecies K. hardwickii depressa should be elevated to species status [Kerivoula depressa]. We discuss our findings and the caveats of this and similar studies. (b) dorsal and (c) ventral views of the skin specimen of holotype (NMNS 17595). Etymology: The proposed English name is ‘Dark woolly bat’.The name refers to the very dark pelage of the new species. Figure 5. 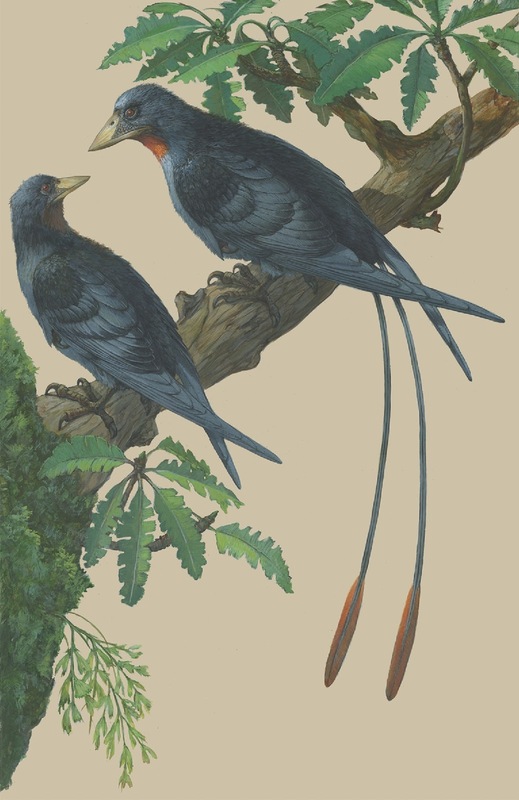 In vivo reconstruction of a male and female pair of Eoconfuciusornis. Artwork by Michael Rothman. 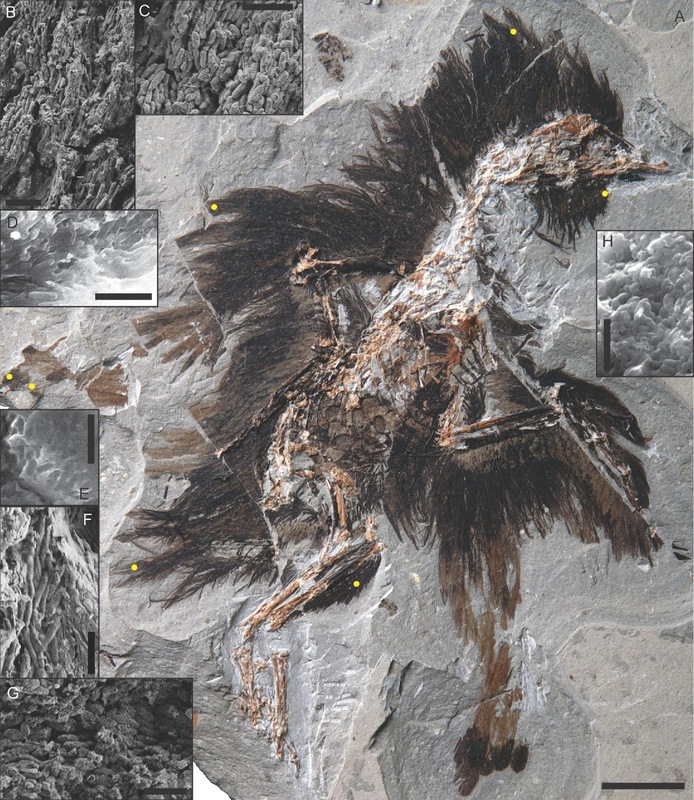 We report on an exceptional specimen of Eoconfuciusornis preserving rare soft-tissue traces of the ovary and wing. 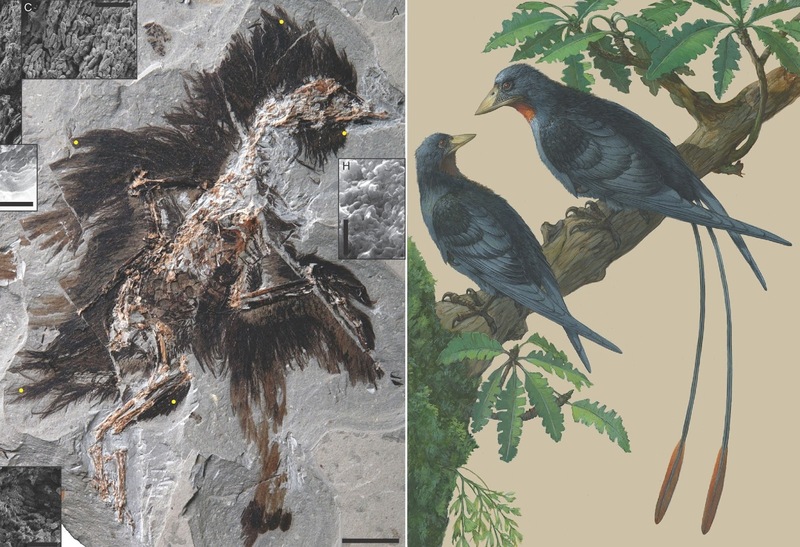 Ovarian follicles preserve a greater hierarchy than observed in Jeholornis and enantiornithines, suggesting confuciusornithiforms evolved higher rates of yolk deposition in parallel with the neornithine lineage. The preserved soft tissues of the wing indicate the presence of a propatagium and postpatagium, whereas an alular patagium is absent. Preserved remnants of the internal support network of the propatagium bear remarkable similarity to that of living birds. Soft tissue suggests the confuciusornithiform propatagium could maintain a cambered profile and generate lift. The feathers of the wing preserve remnants of their original patterning; however, this is not strongly reflected by observable differences under scanning electron microscopy (SEM). 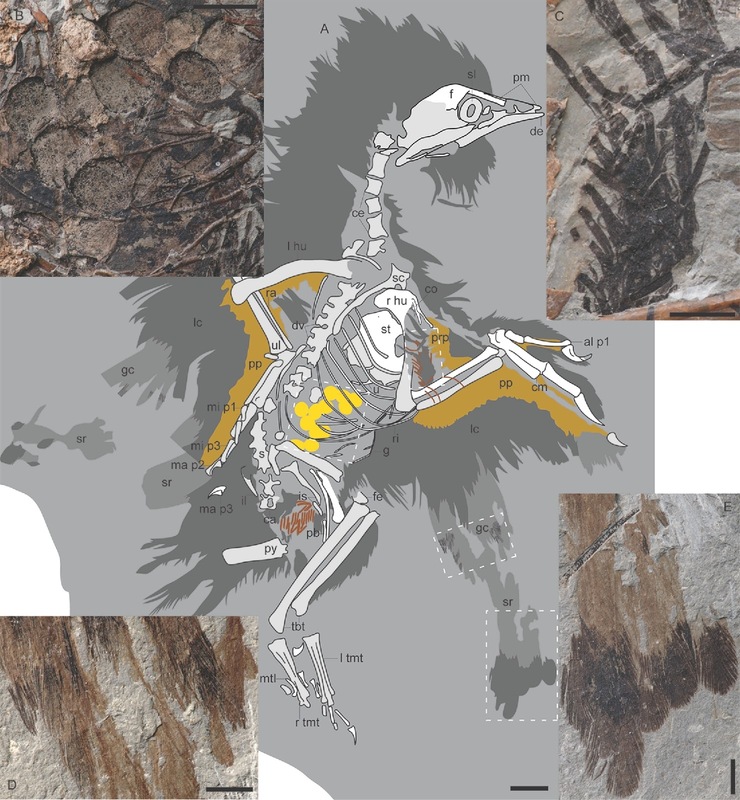 The tail plumage lacks elongate rectrices, suggesting that the earliest known confuciusornithiforms were sexually dimorphic in their plumage. Figure 1. (a) Photograph of Eoconfuciusornis indet. STM7-144, preserved in right lateral view; scale bar equals 20 mm. Inset SEM images (all scale bars equal 2 μm); (b) left-wing coverts (sample 2_2) preserving black eumelanosomes; (c) coronal feathers (sample 2_1) preserving grey eumelanosomes; (d) dark spot of secondaries (sample A) preserving black eumelanosomes; (e) light part of secondaries (sample C) preserving grey mouldic eumelanosomes; (f) tail feathers (sample 2_3) preserving black eumelanosomes; (g) crural feathers (sample 2_4) preserving grey eumelanosomes; (h) submalar feathers (sample G) preserving phaeomelanosomes. Yellow dots indicate location of each sample. Figure 2. (a) Interpretative drawing of Eoconfuciusornis indet. STM7-144; (b) ovarian follicles; (c) remnants of the internal structure of the propatagium with underlying feathers; (d) preserved pattern in the greater coverts; (e) secondary remiges. Scale bar equals 10 mm in (a) and 5 mm in all insets. Anatomical abbreviations: al, alular metacarpal; ca, caudal vertebrae; ce, cervical vertebrae; cm, carpometacarpus; co, coracoid; cv, wing coverts; de, dentary; dv, dorsal vertebrae; f, frontal; fe, femur; g, gastralia; gc, greater coverts; hu, humerus; il, ilium; is, ischium; l, left; lc, lesser coverts; ma, major metacarpal; mc, marginal coverts; mi, minor metacarpal; mt, metatarsal; p1-3, manual phalanges; pb, pubis; pm, premaxilla; pp, postpatagium; prp, propatagium; py, pygostyle; ra, radius; ri, ribs; s, synsacrum; sc, scapula; sl, scleral ossicles; sr, secondary remiges; st, sternum; tbt, tibiotarsus; tmt, tarsometatarsus; ul, ulna; u, uncinate process. Yellow indicates preserved remnants of maturing ovarian follicles; dermal and epidermal tissue remnants are indicated in tan; remains of collagen fibres are brown. Dark grey indicates body feathers and the dorsal layer of wing coverts; light grey indicates the greater coverts and secondaries with preserved patterning. White dashed boxes represent areas enlarged in insets. Figure 5. In vivo reconstruction of a male and female pair of Eoconfuciusornis. Summary: A team of scientists has described the most exceptionally preserved fossil bird discovered to date, in a newly published article. 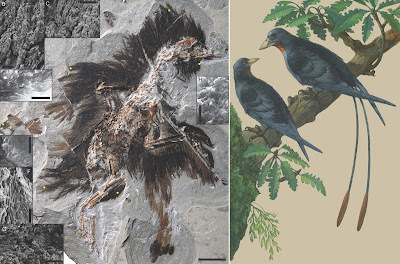 The new specimen from the rich Early Cretaceous Jehol Biota (approximately 131 to 120 million years old) is referred to as Eoconfuciusornis, the oldest and most primitive member of the Confuciusornithiformes, a group of early birds characterized by the first occurrence of an avian beak. from the Upper Jurassic of the Lusitanian Basin. 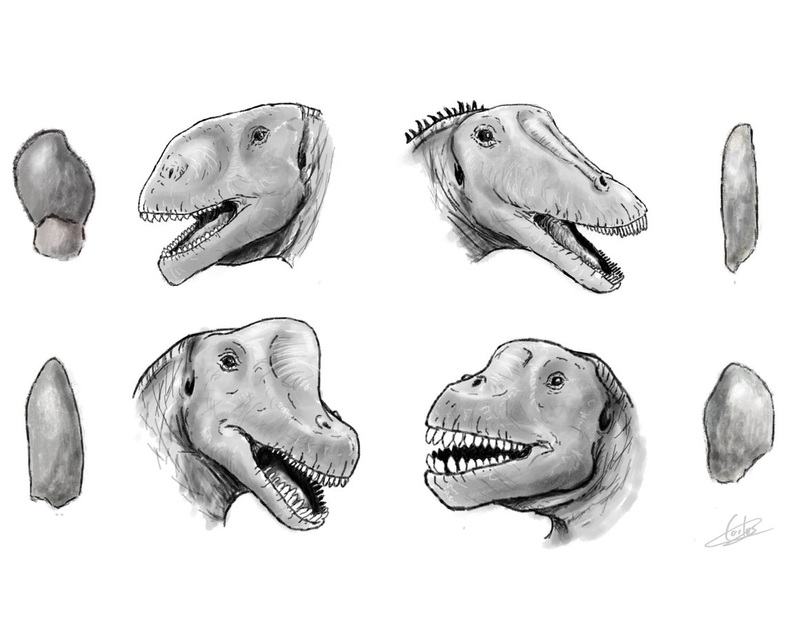 The Upper Jurassic of the Lusitanian Basin has yielded an important fossil record of sauropods, but little information is available about the tooth morphotypes represented in this region. 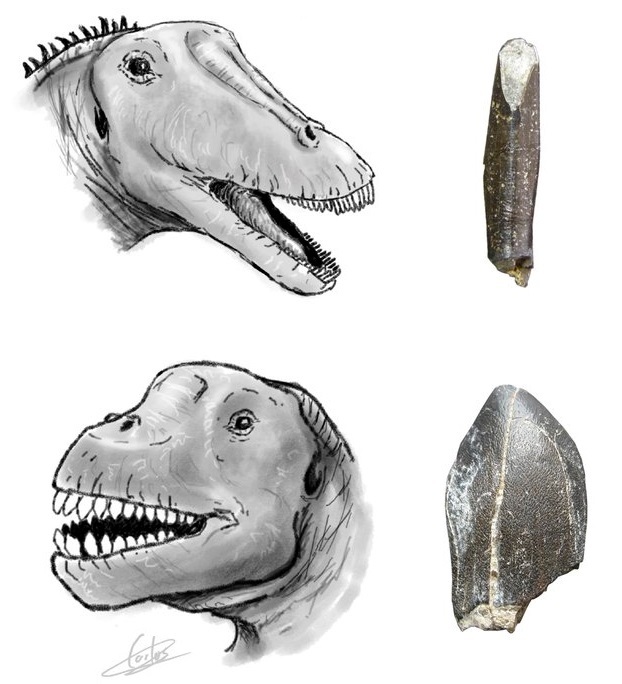 A large sample of teeth, both unpublished and published, is described and discussed here. Four main tooth morphologies are identified: spatulate, heart-shaped, pencil-shaped, and compressed cone-chisel-shaped. 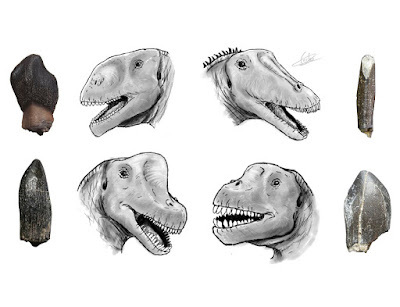 Heart-shaped teeth are considered to be exclusive to a non-neosauropod eusauropod, tentatively referred to Turiasauria. The spatulate teeth can be attributed to members of the Macronaria; they have a complex cingulum, more than one lingual facet and a labial ridge. 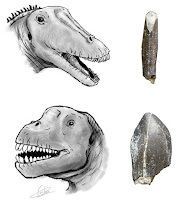 The compressed cone-chisel-shaped teeth are also attributed to macronarians and the presence of an axially twisted apex through an arc of 30°–45° suggests putative affinities with Europasaurus and basal titanosauriforms. The variability observed in the overall morphology and wrinkling pattern of the compressed cone-chisel-shaped teeth may be due to factors related to the tooth position or to the ontogeny of individuals. 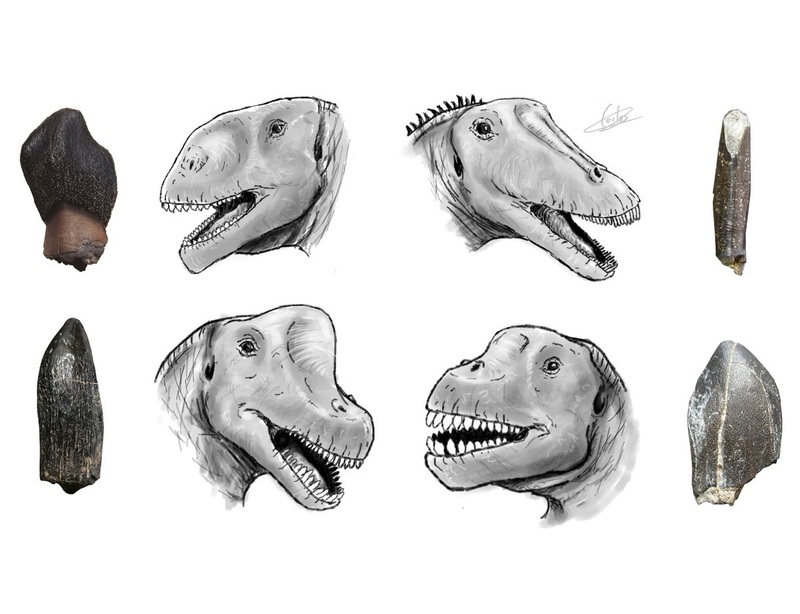 Finally, pencil-shaped teeth with high slenderness index values, oval and apically located wear facets, subcylindrical crowns and lacking carinae, are tentatively assigned to Diplodocoidea. The diversity of tooth morphologies is in accordance with the known palaeobiodiversity of the Portuguese Late Jurassic sauropod fauna, which is composed of non-neosauropod eusauropods (turiasaurs), diplodocoids (diplodocids) and macronarians (camarasaurids and probably brachiosaurids). 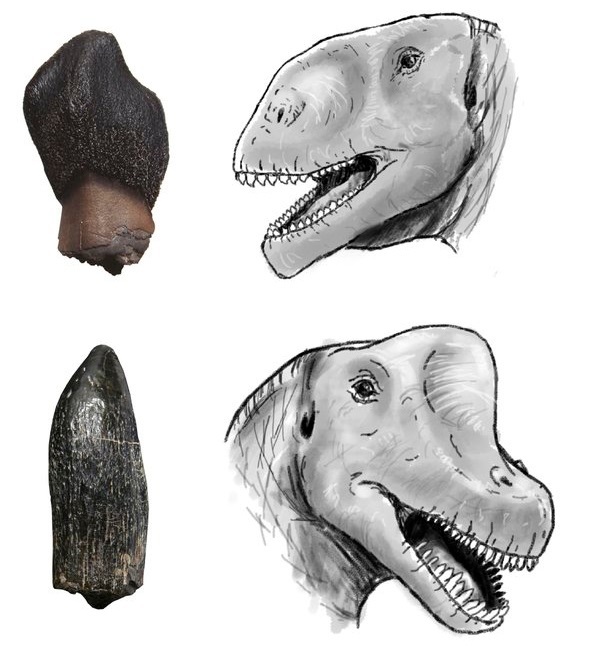 The Late Jurassic sauropod fossil record of the Iberian Peninsula presents the broadest tooth morphospace range in the world from this period, suggesting a wide niche partition for sauropods, and corresponding high taxonomic diversity. 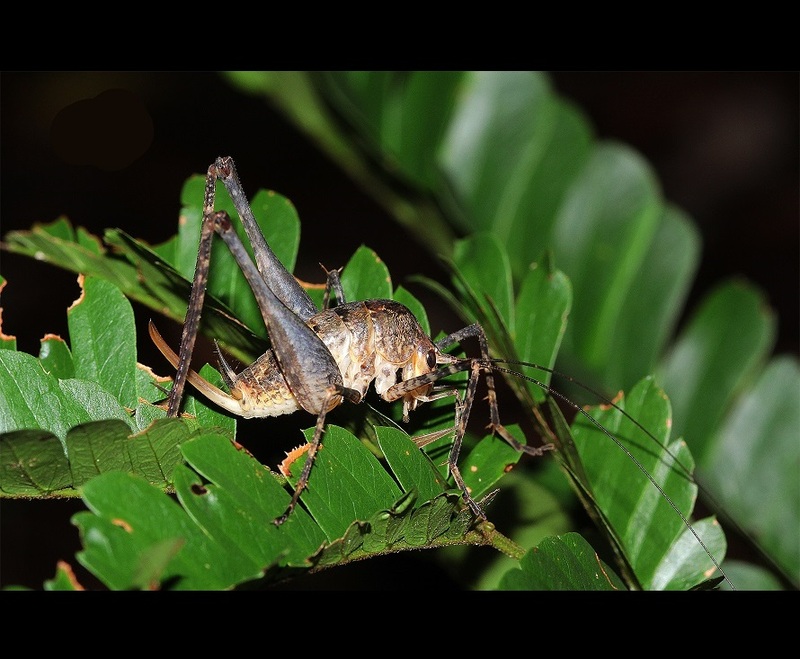 The cis-Andean genus Aphanotorulus was recently revised and comprises six valid species: A. ammophilus, A. emarginatus, A. gomesi, A. horridus, A. phrixosoma and A. unicolor. Herein, a new species is described from tributaries of the rio Aripuanã basin, in Amazonas and Mato Grosso states, Brazil. The new species is easily distinguished from congeners by its color pattern: caudal fin with upper lobe mostly hyaline with dark spots along rays and membranes, and lower lobe red and without dark spots; and absence of dark spots in the lateral series of mid-ventral plates. Fig. 2 Lateral view of Aphanotorulus rubrocauda, MNRJ 37551, paratype, 118.6 mm SL, Brazil, Mato Grosso State, Aripuanã Municipality, rio Aripuanã basin, 500 meters downstream of the rapids of Dardanelos waterfalls. Photographed alive by Fabio Pupo. Fig. 3 Lateral view of Aphanotorulus emarginatus, NUP 17748, 257.3 mm SL, Brazil, Amazonas State, Parintins Municipality, Paraná do Ramos, rio Amazon basin. Photographed alive by Hugmar Pains da Silva. Diagnosis. 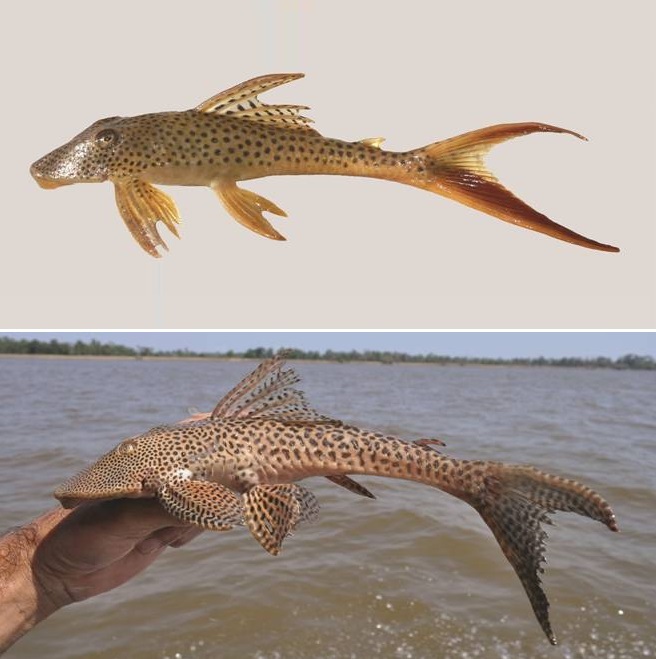 Aphanotorulus rubrocauda can be distinguished from all other species of Aphanotorulus by its color pattern: having a uniformly red colored lower caudal-fin lobe (vs. lower lobe of caudal fin with dark spots on creamy colored background), by the absence of dark spots on the posterior half of mid-ventral lateral plate series (vs. presence of dark spots in all lateral plate series). 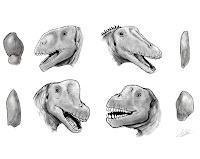 Additionally, Aphanotorulus rubrocauda is distinguished from congeners by having more premaxillary teeth (32-65 per ramus, mean = 45; vs. 15-34, mean = 24) and dentary teeth (30-63 per ramus, mean = 44; vs. 14-34, mean = 25). Aphanotorulus rubrocauda further differs from A. emarginatus by having small round dark spots (vs. dark large and elongated spots) (Fig. 3). Fig. 1 Holotype of Aphanotorulus rubrocauda, INPA 33666, 150.5 mm SL, Brazil, Amazonas State, Apuí Municipality, Resex do Guariba, rio Aripuanã drainage, tributary of the rio Madeira basin, in lateral, dorsal, and ventral views. Andreza S. Oliveira, Lúcia Rapp Py-Daniel and Cláudio H. Zawadzki. 2017. A New Species of Aphanotorulus (Siluriformes: Loricariidae) from the rio Aripuanã basin, Brazil. Neotropical Ichthyology. 15(1); e160034. DOI: 10.1590/1982-0224-20160034. Figure 1. Dorsal habitus of Bolitogyrus electus Smetana & Zheng (A), B. kitawakii (Smetana & Zheng) (B), B. caesareus (Bernhauer) (C), B. proximus (Cameron) (D), B. rufipennis (Cameron) (E), B. pederseni Brunke (F), B. nokrek Brunke (G), B. lasti Rougemont (H) and B. tigris Brunke (I). Figure 2. 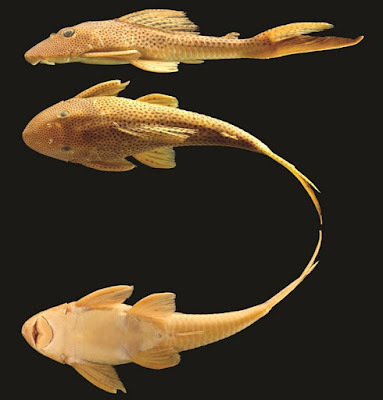 Dorsal habitus of Bolitogyrus sepilok Brunke (A), B. schillhammeri Brunke (B), B. flavus Yuan et al. 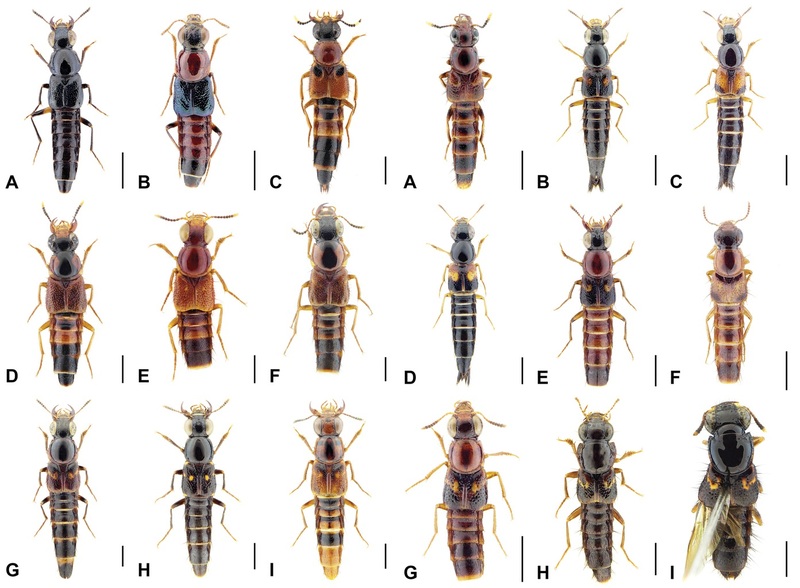 (C), B. fukiensis (Scheerpeltz) (D), B. solodovnikovi Brunke (E), B. smetanai Brunke (F), B. elegans (Cameron) (G), male B. signatus (Cameron) (H) and female B. signatus (I). Scale bars: 2 mm. 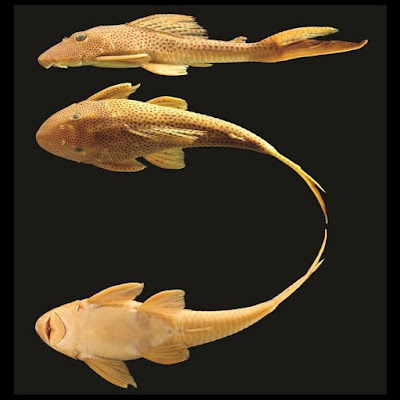 The Oriental species of the relictual genus Bolitogyrus are revised based on 200 specimens. An updated description of the genus is provided, including additional putative synapomorphies. Fifty valid Oriental species are diagnosed herein and the following nineteen are described as new to science: B. concavus sp. n.; B. confusus sp. n.; B. himalayicus sp. n.; B. khasiensis sp. n.; B. luteus sp. n.; B. mulayitensis sp. n.; B. nanus sp. n.; B. nokrek sp. n.; B. pecki sp. n.; B. pederseni sp. n.; B. phukhieo sp. n.; B. rougemonti sp. n.; B. sepilok sp. n.; B. schillhammeri sp. n.; B. smetanai sp. n.; B. solodovnikovi sp. n.; B. temburong sp. n.; B. tigris sp. n.; and B. tumidus sp. 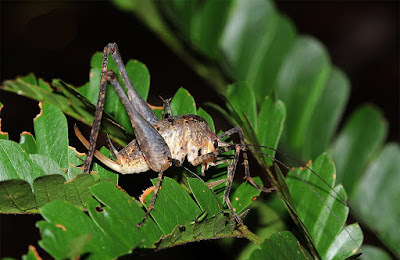 n. The following synonymies are proposed: Cyrtothorax borneensis Cameron, 1942, syn. n. = Cyrtothorax caesareus Bernhauer, 1915; Cyrtothorax octomaculatus Cameron, 1937 syn. n. = Quedius ornatipennis Wendeler, 1927. 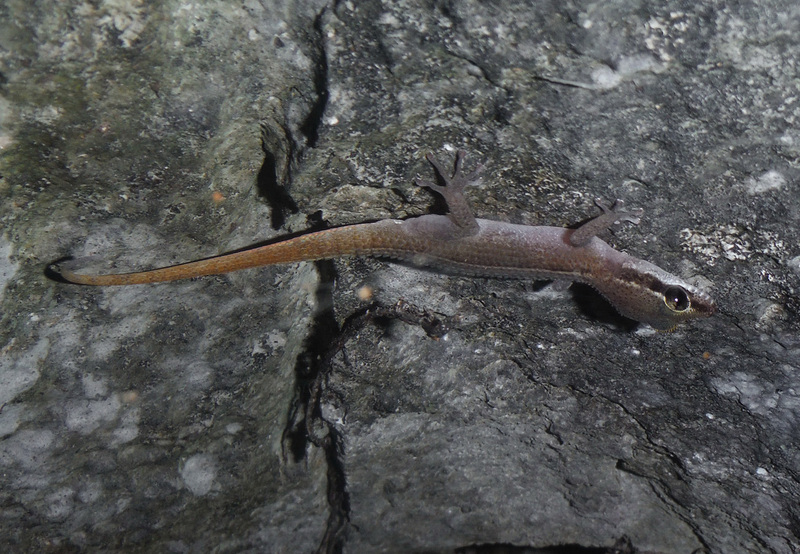 Quedius (Raphirus) ornatipennis is moved to Bolitogyrus as B. ornatipennis (Wendeler), comb. n. A lectotype is designated for Cyrtothorax rufipennis Cameron, 1937. 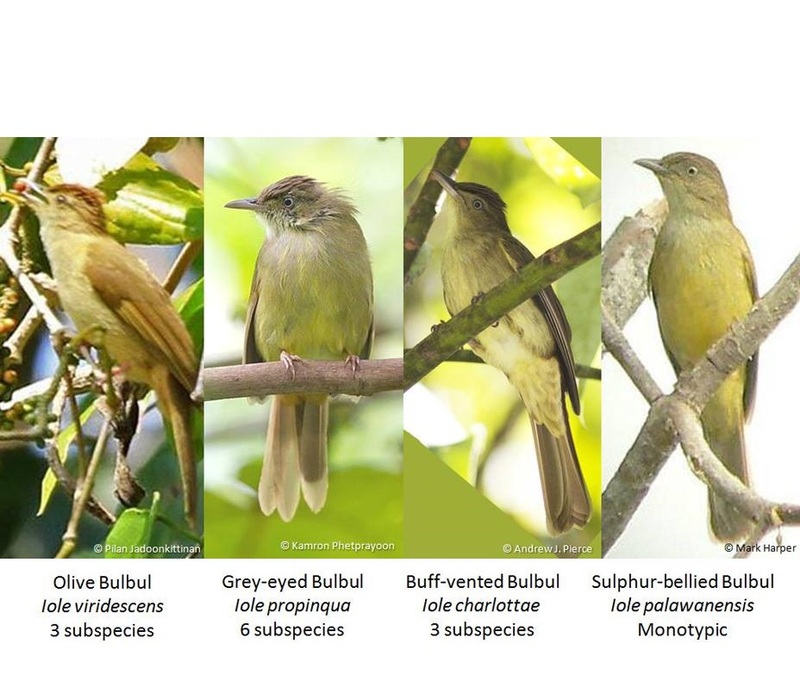 Several species are named in recognition of conservation efforts to protect tropical primary forests in Asia that are important to the survival of many Bolitogyrus species. 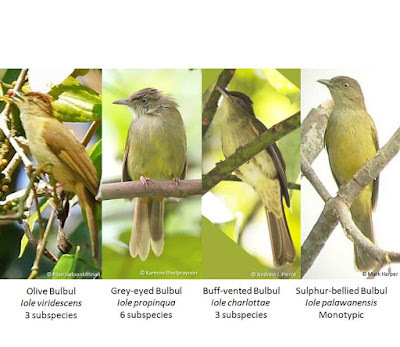 All available bionomic and distributional data for Oriental Bolitogyrus are summarized, and an identification key is provided. We describe Dixonius kaweesaki sp. nov. from Khao Daeng, a limestone mountain in Khao Sam Roi Yot massif, Prachuap Khiri Khan Province, peninsular Thailand. It is diagnosed from all other species by a combination of maximal SVL of 41.6 mm; 12 or 13 longitudinal rows of dorsal tubercles; 24 longitudinal rows of ventrals across the abdomen; a continuous series of 9–11 precloacal pores in males, no pores in females; and two bold dark stripes from the snout to the base of the tail separated by a contrasting light vertebral stripe. It is the eighth species in the genus Dixonius. Lastly, we discuss the type locality of Phyllodactylus paviei, currently regarded as a junior subjective synonym of Dixonius siamensis. 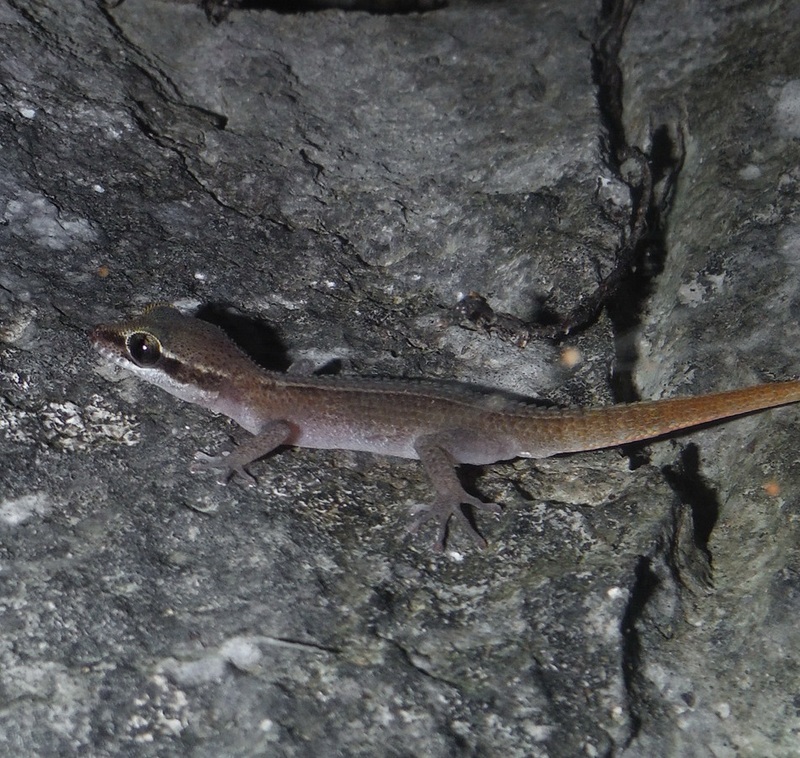 Keywords: Reptilia, Thai-Malay Peninsula, Khao Sam Roi Yot, Dixonius kaweesaki sp. nov. FIGURE 4. Live adult male Dixonius kaweesaki sp. nov. in situ (individual not collected). Etymology. The specific epithet honors the Thai naturalist Kaweesak (Toi) Keeratikiat from Bangkok, in recognition to his help in our herpetological field surveys, and who collected the type series. We suggest the following common names: Djing-djok din Sam Roi Yot (Thai; จิ้งจกดินสามร้อยยอด), Sam Roi Yot Leaf-toed Gecko (English), Dixonius de Sam Roï Yot (French), Samroiyot Blattfingergecko (German). Mimadiestra sirindhornae sp. nov. is described from Sakaerat Environmental Research Station, Nakhon Ratchasima Province, Thailand. The new species is easily distinguished from M. biloba by the shape of the projection of male 7th abdominal tergite, by the shape of male paraprocts and by blackish brown body. Distribution. Thailand (Nakhon Ratchasima Province). Etymology. The specific epithet is a patronym for Princess Maha Chakri Sirindhorn. Thai Name. Takkatan Kuharat (ตั๊กแตนคูหารัตน์), name given by Her Royal Highness Princess Sirindhorn. Habitats. The new species was collected at 350-450m altitude from leaves of a bush about 20-40 cm above ground. Pattarawich Dawwrueng, Sergey Yu. Storozhenko and Taksin Artchawakom. 2016. Mimadiestra sirindhornae sp. 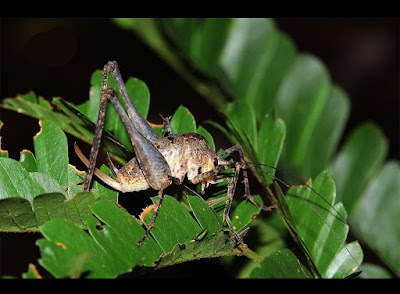 nov. from Thailand (Orthoptera: Rhaphidophoridae: Aemodogryllinae). The Thailand Natural History Museum Journal. 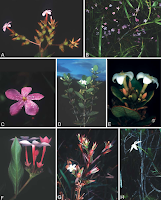 10(2); 61-66.
by subsequent herbarium studies, two species new to science are described. The first, from eastern Bhutan and adjacent Arunachal Pradesh and Tibet, has long been cultivated under the names M. grandis or M. grandis GS600, and has recently been described as M. grandis subsp. orientalis (Grey-Wilson, 2010). It is the national flower of Bhutan. 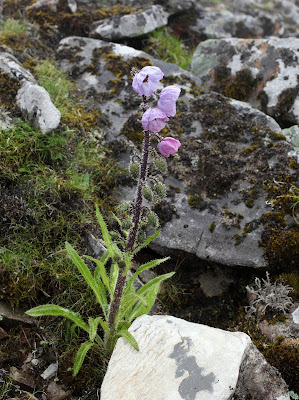 However, the type of M. grandis from Sikkim belongs to a species quite distinct from the eastern populations and the latter is now described as a new species, Meconopsis gakyidiana. 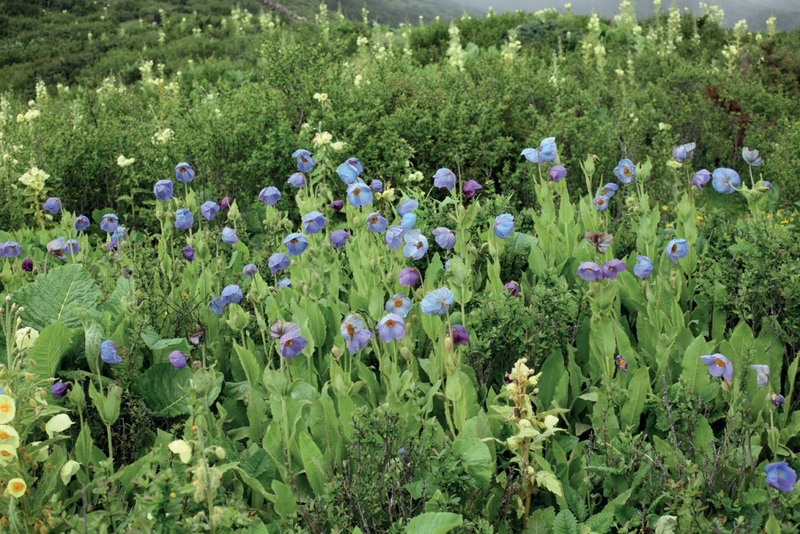 The second novelty, Meconopsis merakensis, is newly described from eastern Bhutan and adjacent Arunachal Pradesh. In the past this species was confused with the closely allied M. prainiana. The two species are isolated geographically, M. prainiana being found only much further to the north-east, in south-eastern Tibet, including the Tsari valley. The title of this article is based on a comparison made by Frank Kingdon-Ward of Meconopsis flowers with butterflies in Tibet (see below). Fig. 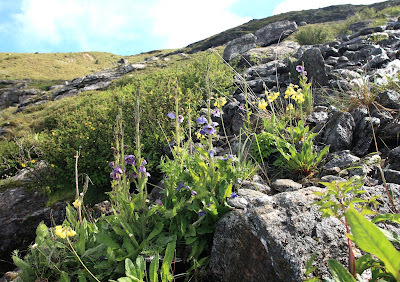 2 Colony of Meconopsis gakyidiana, surrounded by yellow-flowered M. paniculata, at Tsejong, Merak, east Bhutan, alt. 4,000m. Photo: T. Yoshida (2014), 1, vii. 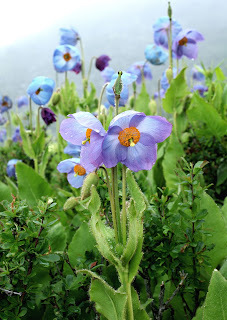 • Meconopsis gakyidiana T. Yoshida, R. Yangzom & D. G. Long, nom. et stat. nov.; nom. nov. for Meconopsis grandis Prain subsp. orientalis Grey-Wilson, Sibbaldia 8, 81 (2010). Type: NE Bhutan, Cho La, Ludlow, Sherriff & Hicks 20801 (BM, holotype). 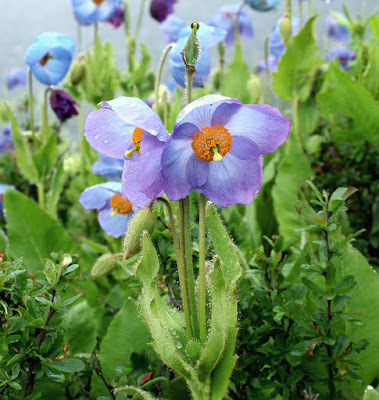 Meconopsis grandis auct. non Prain, G. Taylor, The Genus Meconopsis 68 (1934), pro parte. Diagnosis: M. baileyi Prain affinis, sed flore crateriformi, petalis manifeste concavis, thecis aurantiacis, atque stylo longiore difert. M. gakyidiana is similar to M. baileyi, but differs from the latter in the bowl-shaped flower with distinctly concave petals, orange-coloured thecae and longer style. Distribution: Eastern Bhutan, western Arunachal Pradesh of India, southern Xizang (Tibet) of China; 3,700–4,300m in elevation. 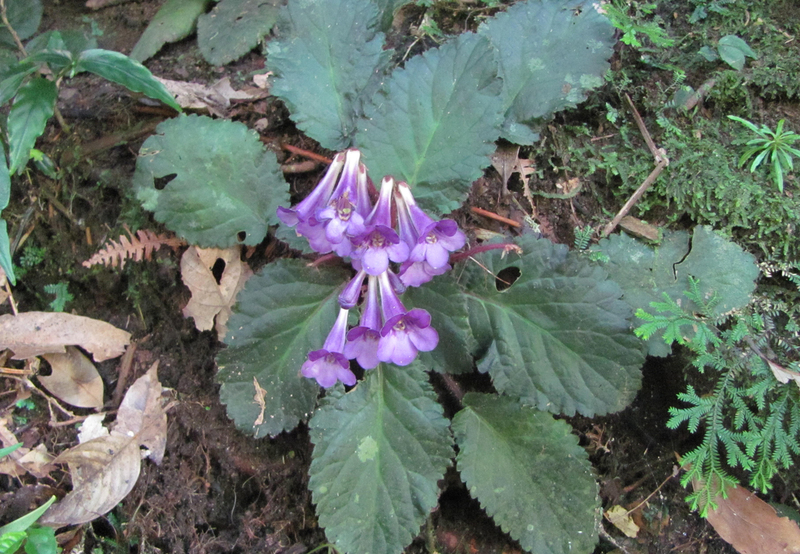 Habitat: Open shrubberies, lush pastures, beside rubble walls in grazing grounds, rarely on the sunny edge of sub-alpine forests; often forming a loose tuft with short rhizomes and gregariously growing together with shrubs and other tall herbs. 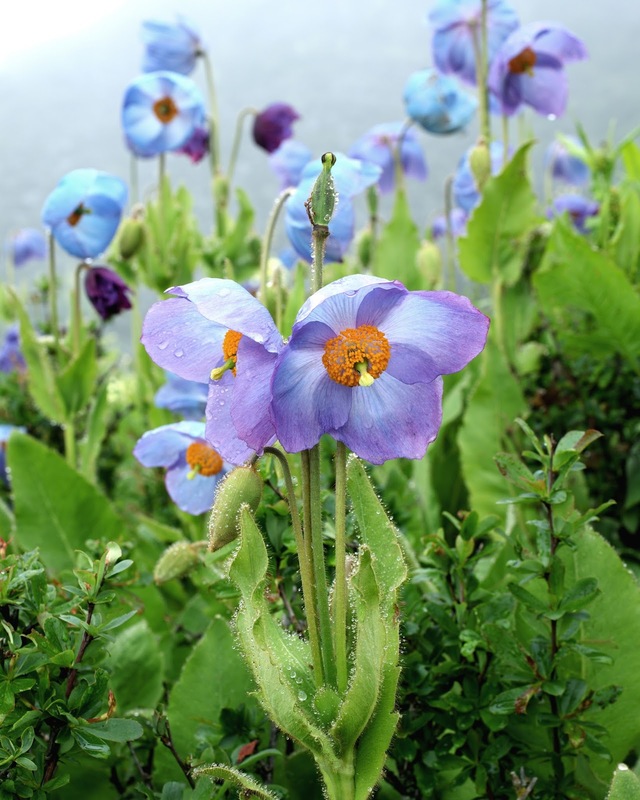 • Meconopsis merakensis T. Yoshida, R. Yangzom & D.G. Long, sp. nov. Diagnosis: M. prainianae Kingdon-Ward affinis, sed capsulis longioribus et subcylindricis differt. M. merakensis differs from M. prainiana in its longer and sub-cylindrical fruit capsules. Distribution: Eastern Bhutan: Merak and Sakten regions of Tashigang district; India: western Arunachal Pradesh, region around Orka La and Bhangajang, Tawang district, Mago district; 3,800–4,500m in elevation. Habitat: West, north-west or north-east facing steep rocky slopes, partly moss-covered boulder slopes or grassy and rocky slopes above tree-line, exposed to intermittent foggy rains of summer monsoon; rooting deep among rocks with scanty soil. 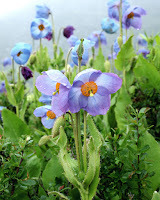 • Meconopsis merakensis var. albolutea T. Yoshida, R. Yangzom & D. G. Long, var. nov.
As stated in the introduction above, parts of the vast mountain ranges between Bhutan, northern Myanmar and south-west China remain very poorly explored botanically, even for such showy plants as Meconopsis. The new discoveries reported here demonstrate that diligent field work, using the modern technology of digital photography, can reveal plants new to science and often not brought into cultivation in the past. Sometimes these plants have been collected by early explorers, but those collections were often too limited to allow detailed scientific study without further material. However, when re-examined in conjunction with new specimens and images, proper scientific investigation can reveal new botanical treasures. Toshio Yoshida, Rinchen Yangzom and David Long. 2017. Dancing Butterflies of the East Himalayas: New Meconopsis Species from East Bhutan, Arunachal Pradesh and South Tibet. SIBBALDIA: The Journal of Botanic Garden Horticulture. 14; 69-96. Oreocharis caobangensis T.V.Do, Y.G.Wei & F.Wen, sp. 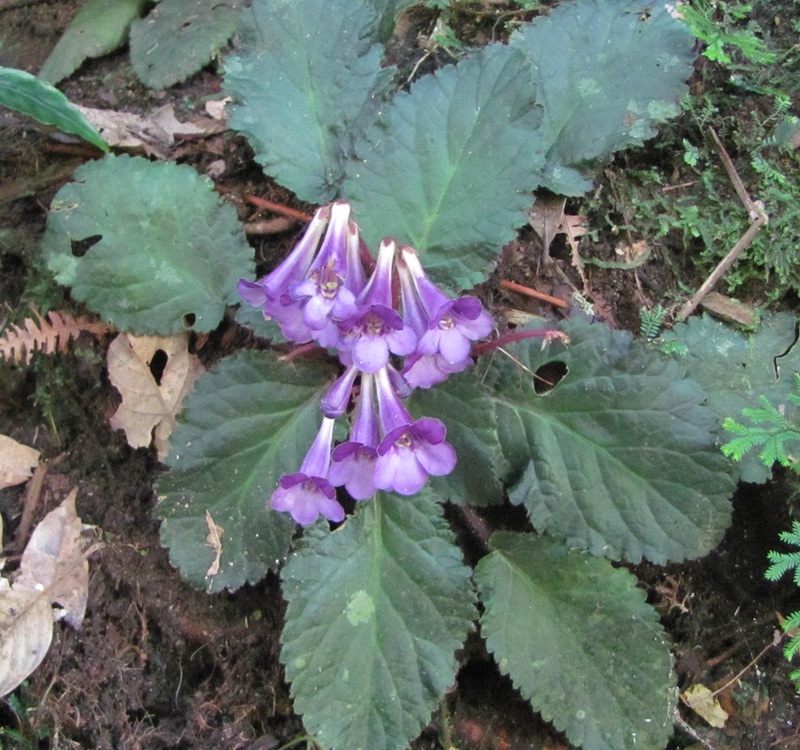 nov.
Etymology:— The specific epithet refers to Cao Bang Province in northern Vietnam where Oreocharis caobangensis was found. The type location of this new species is in Phia Oac-Phia Den National Park, a famous national park in Cao Bang Province. Truong Van Do, Yi-Gang Wei and Fang Wen. 2017. Oreocharis caobangensis (Gesneriaceae), A New Species from Cao Bang Province, northern Vietnam. 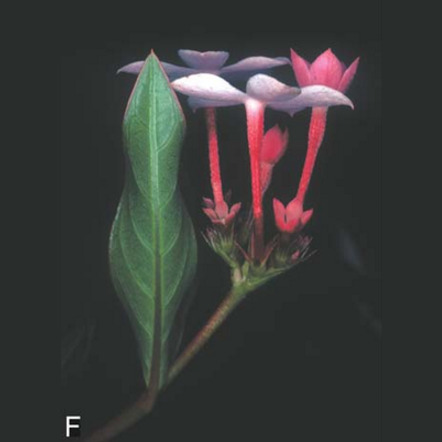 Inflorescence with flowers at different stages of anthesis. The process of anthesis of Sipaneopsis is unique within the Rubiaceae, and is here described and illustrated in detail for the first time. During the initial stage of anthesis the flowers are small, with the corolla lobes already open and erect before tube elongation, and the corolla lobe basal appendages are appressed against each other, forming a convex structure at the corolla mouth obstructing the entrance of visitors and pollinators. At the final stage of anthesis, the corolla lobes reflex and become perpendicular to the tube, and their basal appendages become erect, not touching each other, allowing visitors and pollinators to access the corolla tube and the nectar disk. Neobertiera and Sipaneopsis are unique within the tribe Sipaneeae in having indehiscent dry fruits and recent molecular phylogenies positioned them as sister taxa. Sipaneopsis is distinguished from Neobertiera in having flowers consistently homostylous (vs. distylous or rarely tristylous in Neobertiera), stamens inserted at the middle of the corolla tube (vs. at variable positions), and five triangular appendages at the base of each corolla lobe (vs. corolla lobes thickened at base, without appendages). The differences in flower morphology and process of anthesis between the two genera (which most likely influence their different pollination syndromes) provide an important set of significant taxonomic and diagnostic characters that can be used to distinguish them. Sipaneopsis maguirei. Inflorescence with flowers at different stages of anthesis. Fig. 1. Selected genera of Sipaneeae. 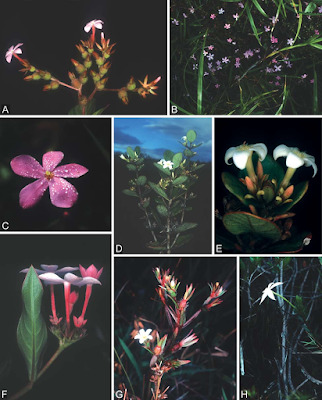 A, Sipanea wilson-brownei; B–C, Sipanea veris; B, habit; C, detail of open corolla with exserted style; D–E, Chalepophyllum guyanense; D, habit with axillary inflorescences; E, detail of open corollas and flower buds; F, Sipaneopsis maguirei, inflorescence with two flowers on front with open corolla lobes before tube elongation, and flower in the back with tube in intermediate phase of expansion; G, Limnosipanea palustris; H, Maguireothamnus tatei. A and H photos, S. Mori; B–G photos; P. Delprete. Fig. 5. 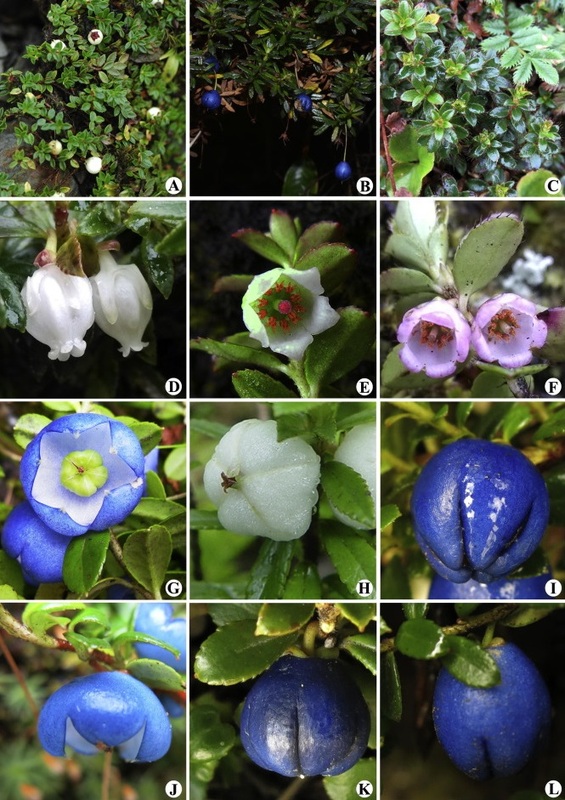 Habit, leaf morphology, flowers, and fruit in selected species of Gaultheria series Trichophyllae. A: Gaultheria marronina (L. Lu et al. LL-2011-37) showing prostrate habit and white slightly open fruit with maroon capsule; B: G. dolichopoda (L. Lu et al. LL-2014-25) showing erect habit, blue fruit, and long pedicel; C: G. trichophylla var. 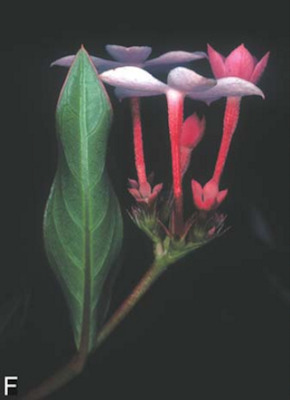 trichophylla (L. Lu et al. LL-2013-47) showing leaves with long marginal setae; D: G. cardiosepala (L. Lu et al. LL-2014-44) showing urceolate white corolla; E: G. stenophylla (L. Lu et al. LL-2014-8) showing campanulate white corolla with two-awned anther thecae; F: G. trichophylla var. 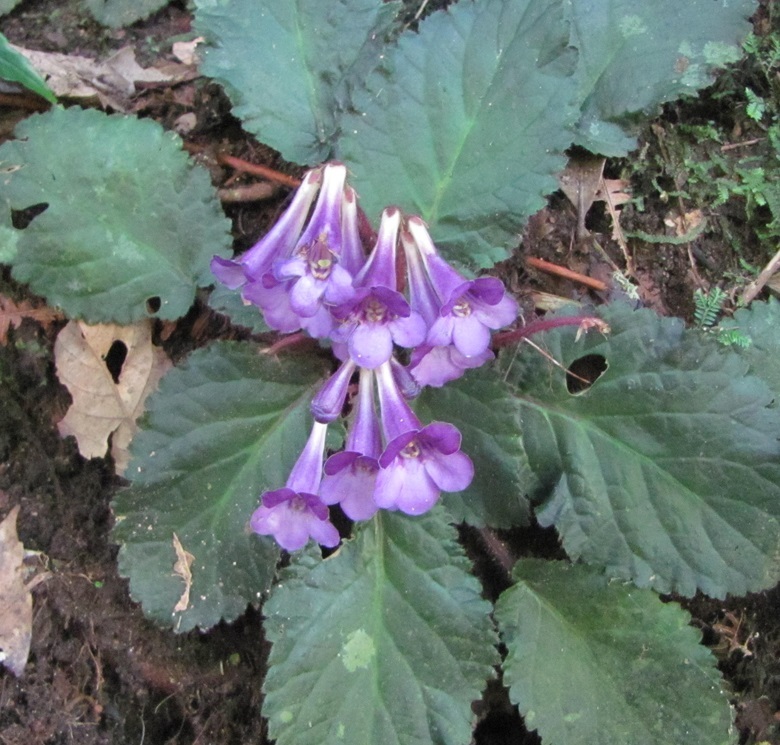 tetracme (L. Lu & M. Y. Zhang LL-2015-14) showing campanulate pink corolla and leaves with notable marginal setae; G: G. ciliisepala (L. Lu et al. LL-2013-20) showing open fruit with green capsule; H: G. cardiosepala (L. Lu et al. 6-0516) showing closed white fruit; I: G. stenophylla (L. Lu et al. 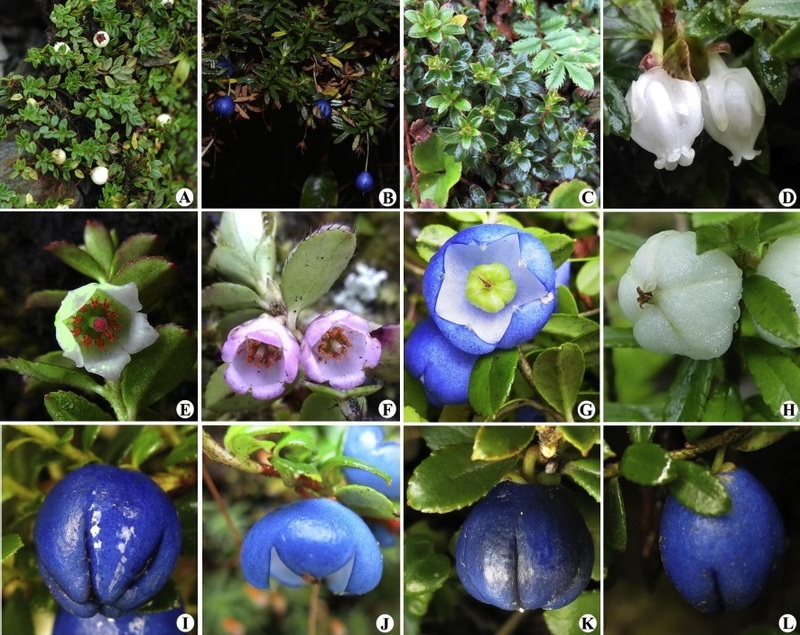 LL-2013-7) showing nearly closed blue fruit; J: G. ciliisepala (L. Lu et al. LL-2013-20) showing open blue fruit; K: G. crassifolia (L. Lu et al. 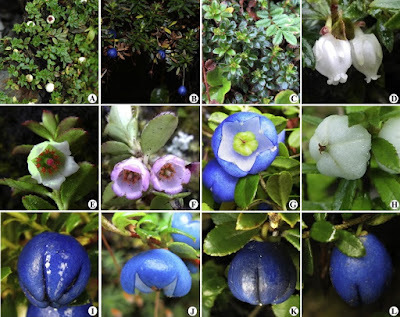 LL-2013-13) showing closed blue fruit; L: G. stenophylla (L. Lu et al. LL-2013-7) showing nearly closed blue fruit. Photographs: A, C, E, H, J, K, L by L. Lu; B by J. Cai; D, F, G, I by M. Y. Zhang. • Phylogenetic relationships of Gaultheria series Trichophyllae are reconstructed with plastid phylogenomic analyses. • Eight sequence divergence hotspot regions are screened across the plastid genomes of the studied individuals. • Morphological characters important for species delimitation in G. series Trichophyllae are traced onto the phylogeny. Gaultheria series Trichophyllae Airy Shaw is an angiosperm clade of high-alpine shrublets endemic to the Himalaya-Hengduan Mountains and characterized by recent species divergence and convergent character evolution that has until recently caused much confusion in species circumscription. Although multiple DNA sequence regions have been employed previously, phylogenetic relationships among species in the group have remained largely unresolved. Here we examined the effectiveness of the plastid genome for improving phylogenetic resolution within the G. series Trichophyllae clade. Plastid genomes of 31 samples representing all 19 recognized species of the series and three outgroup species were sequenced with Illumina Sequencing technology. Maximum likelihood (ML), maximum parsimony (MP) and Bayesian inference (BI) phylogenetic analyses were performed with various datasets, i.e., that from the whole plastid genome, coding regions, noncoding regions, large single-copy region (LSC) and inverted-repeat region a (IRa). The partitioned whole plastid genome with inverted-repeat region b (IRb) excluded was also analyzed with ML and BI. Tree topologies based on the whole plastid genome, noncoding regions, and LSC region datasets across all analyses, and that based on the partitioned dataset with ML and BI analyses, are identical and generally strongly supported. Gaultheria series Trichophyllae form a clade with three species and one variety that is sister to a clade of the remaining 16 species; the latter comprises seven main subclades. Interspecific relationships within the series are strongly supported except for those based on the coding-region and IRa-region datasets. Eight divergence hotspot regions, each possessing >5% percent variable sites, were screened across the whole plastid genome of the 28 individuals sampled in the series. Results of morphological character evolution reconstruction diagnose several clades, and a hypothesis of adaptive evolution for plant habit is postulated.